The first of three spacewalks in nine days by International Space Station Commander Michael Lopez-Alegria and Flight Engineer Sunita Williams is scheduled to begin Wednesday at 10 a.m. EST. The three spacewalks, from the Quest airlock in U.S. spacesuits, and a Russian spacewalk scheduled for Feb. 22 will be the most ever done by station crew members during an increment, said Mike Suffredini, station program manager. They also will bring to 10 the total number of spacewalks by Lopez-Alegria, an astronaut record. Williams will have a total of four, a women�s record. Doing the spacewalks close together can save considerable crew time. 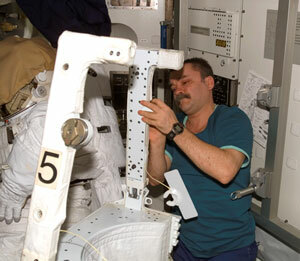 Preparation of the airlock and the suits for a spacewalk normally requires about 100 crew-member-hours. By doing the spacewalks close together, some of the preparations will not have to be repeated for the second and third spacewalks. Program officials believe four days between spacewalks should provide adequate crew rest. The four-day gap could be increased to provide additional rest, or to deal with any issues that arise. "In the future," said Kirk Shireman, ISS deputy program manager, "we will try to group EVAs together when we have to do more than one U.S. stage EVA." Derek Hassmann, spacewalk flight director, noted that there have been five "stage" spacewalks, those without a shuttle present, over the past four years. These three, designated EVAs 6, 7, and 8, will be done in nine days. EVA 7 is set for Feb. 4, EVA 8 for Feb. 8. Chris Looper, a space station trainer working from the station flight control room in Houston�s Mission Control Center, will serve as ground intravehicular officer (ground IV). He will work with the spacewalkers, offering advice and guidance to help them through their tasks. Flight Engineer Mikhail Tyurin will help with pre-and post-spacewalk activities. The focus of the first two spacewalks is continuing the transition from temporary station power and cooling systems to permanent ones, a process begun during Discovery�s STS-116 mission in December. Since that flight four cooling loops have been active on the U.S. segment, two in the temporary system which continued to cool the U.S. laboratory Destiny and two in the permanent system. Because of an ammonia leak during the installation of Destiny during STS-98 in February 2001, new crew and ground responses have been developed should a similar leak occur during these spacewalks. Lopez-Alegria, the lead spacewalker wearing the suit with red stripes, and Williams, in the all-white suit, begin the tasks of the first spacewalk by reconfiguring one of the two cooling loops serving Destiny from the temporary to the permanent system. Working at the �rats� nest,� an area near the base of the Z1 Truss with numerous fluid and electrical connections, Lopez-Alegria will reconfigure the fluid loop connections, moving two of the fluid lines from the early system from the lab and connecting them back up to the Z1 panel. That will help enable reactivation of the early cooling system if it should be required. He also will connect a cable for the Space Shuttle Power Transfer System (SSPTS). It will allow power from the station�s solar arrays to be transferred to the docked space shuttle, beginning with STS-118 in June. Williams will reconfigure electrical connections. Those jobs are expected to take about 1 hour, 45 minutes. Next the spacewalkers will stand by as the ground retracts the starboard radiator of the P6 Truss. After retraction they will install six cable cinches and two winch bars to secure it and then install a shroud over it. Those tasks should take about 2 hours, 20 minutes. Lopez-Alegria and Williams then move to the Early Ammonia Servicer on P6. It provided a contingency supply of ammonia for the Early Ammonia System. With the permanent cooling system working, it is no longer needed. The spacewalkers will remove two fluid lines from the servicer, which will be jettisoned this summer. Get-ahead tasks, if time is available, include photographing the unretracted P6 starboard solar wing and installing the Node Local Area Network cable. The cable will help provide the capability to command Russian segment systems from the U.S. segment. The first parts of the Feb. 4 spacewalk are similar to the previous one. Lopez-Alegria and Williams begin the tasks of the second spacewalk by reconfiguring the second of the two cooling loops serving Destiny from the temporary to the permanent system. At the rats� nest, Lopez-Alegria will reconfigure the fluid loop connections, moving the second pair of the fluid lines of the early system from the lab and connecting them back up to the Z1 panel. That will help enable reactivation of the early cooling system if it should be required. Williams will reconfigure electrical connections. The job, like the similar activity on the first spacewalk, is expected to take about 1 hour, 45 minutes. Next they will watch as the ground retracts the aft radiator of the P6. After retraction they will install another set of six cable cinches and two winch bars to secure the radiator and then install the shroud. Again, those tasks should take about 2 hours, 20 minutes. Lopez-Alegria will then move to the end of PMA-1 to remove a sunshade from the Node Multiplexer-Demultiplexer (MDM), a data relay system. The area was in the sun during the time the station flew in a previous orientation. Now, with the station's orientation putting the lab in the direction of travel and its 18-inch window always facing the Earth, the sunshade is being removed to keep the MDM from getting too cold. Lopez-Alegria will remove a single bolt to free the sunshade, then move with it a short distance on the PMA-1 and jettison it aft and a little to starboard. Meanwhile, Williams will bring tools and cables to the forward end of the lab, where Lopez-Alegria will join her. Together they will finish routing and installation of the SSPTS cables. Get-ahead tasks include photographing a connector on the end of PMA-2. Shuttle-station audio communication difficulties have been reported during recent shuttle missions. Engineers believe the connector might be affected by debris or corrosion. On Feb. 8 Lopez-Alegria and Williams will move from the airlock out to Crew Equipment Transfer Aid carts on the rails of the main truss. Pushing the cart with their equipment, including a foot restraint, they move to the P3 Truss. Their first job is to remove two thermal shrouds from a Rotary Joint Motor Controller (RJMC) on P3. Next they will remove the two large shrouds from P3 Bays 18 and 20. The shrouds, larger than king-size bed sheets, provide thermal shading. With the station in its present orientation, they are no longer needed. They are being removed to avoid trapping heat. Spacewalkers will work together to fold each into a package a bit smaller than an outdoor garbage can and jettison them, aft and slightly downward. The 2-hour, 40-minute shroud task will be followed by deployment of two Unpressurized Cargo Carrier Assembly Attachment Systems (UCCAS), one on the upper face of the P3 truss and the other on the lower face. The hour-long job is in preparation for attachment of a cargo carrier during a subsequent shuttle mission. While Lopez-Alegria works on the second UCCAS, Williams will move out to the end of the P5 truss to remove two launch locks to prepare for the relocation of the P6 Truss. Get-ahead tasks include removing a final camera stanchion from External Stowage Platform 3 and moving an auxiliary bag containing contingency items � among them tie-down tethers, cabling and connector caps. The bag will be placed near the airlock before the P6 is moved to the end of the port truss. On Feb. 22, Lopez-Alegria and Tyurin are scheduled to do a spacewalk in Russian Orlan suits from the Pirs airlock. They will work on an antenna of the Progress 23 unpiloted cargo carrier, docked at the aft port of the Zvezda service module. The antenna did not properly retract when that spacecraft docked in October. The spacewalkers will try to secure or remove the antenna to avoid its interfering with the undocking of P23 in April.